The One Room Challenge Week 2 was a bit crazy in the Jones household. About 3 weeks ago our sink and shower stopped working, so we decided to pull the trigger on replacing all the galvanized plumbing with PVC. It was past time to do it we really were just waiting until we had the money anyways. We scheduled it and he quoted us with a day and a half to complete the job. No big deal, we’d just stay with my parents. Long story short he got in there and found more wrong than he thought and the job took from Friday morning until Monday evening... so I lost all weekend to do anything in our master. But luckily a mood board can be done on my laptop, remotely, and with mojitos in hand. It took me a long, long week to find anything that inspired me for this room. I always try to find one piece that gives me a vision for the space. This time it was this beautiful rug from AllModern. It was turkish(faux) but still had a light color palette - totally got my creative juices pumping. We grabbed this headboard I had my eye on from AllModern back when ChrisLovesJulia gave us the headsup that it was on sale. We got it for something like 40% off! If you follow my Stories you'll remember we had to put in a plywood base since it was the King and needed more support in the middle (aka where I sleep). 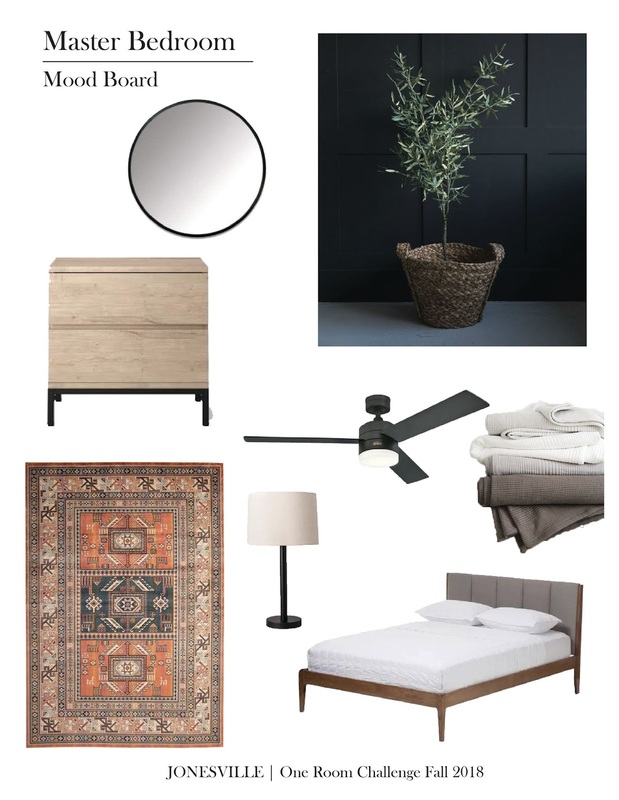 I am still not 100% sure if I should paint the walls dark like in the mood board or keep it light and airy. I'm feeling the dark pull since the rest of our house is the light SW Repose Gray. Drop your thoughts below and I'll love you forever. Did I also mention that we got brand new phones on Tuesday? Jumped from the iPhone 6 to the iPhone Xs. So far we are loving it (especially the camera) but it really does have a learning curve with no more home button. Naturally, at the end of every post you can click the ORC logo to go to all the Week 2 Guest Participant links! Tag me in your favorites on Instagram and I'll share them in my Stories! thanks!! I’m feeling the same lately! Oh this is PRETTY. I remember your last ORC room and loved it! Can't wait to see how this turns out! Aww thanks Bethany!! I’m super excited to get started on it! Looks like it's going to be beautiful!! Where ever did you find that rug?? Thanks!! AllModern! They have awesome rugs! No more home button on the iPhone?! Wow. Regarding the paint color, I love a little bit of dark gray but if the rest of the home is that color maybe light and airy is good. If you could do both in the same room that would be perfect! Can’t wait to see the result! Haha I know! I like it though! I’m thinking the same thing, thank you!! It looks like the room will be stunning! I love the idea of moody colors. Thank you! Same, I’m really looking forward to it!